Every once in a while, I’ll be talking to someone about the trail and I’ll be asked if thru-hikers need to carry all the food they’ll need from Georgia. Assuming each day’s food weighs 1.5 pounds, which is a conservative estimate, that would mean that hikers would each carry some 250+ pounds of food when they climbed up Amicalola Falls. Because 250 pounds isn’t exactly ultralight enough to keep the Jardi-Nazis happy, thru-hikers rely on resupplying at towns along the trail. While we cross roads often on the Appalachian Trail, we’ll generally only go to a town every three to six days. When we do, we’ll pick up supplies at either the local grocery store/Dollar General/Walmart/gas station or at the post office, where our food and other essentials might be found in a box sent from home. I’ve certainly used both methods of resupplying, but I’m quite partial to using mail drops. While at the outset these might be more complicated than spontaneously resupplying at stores, I’ve found that the quality and lightness of the food I can send to myself makes mail drops worth the extra effort. Today, I thought I would address what, in my mind, is an essential step in preparing for a thru-hike: packing resupply boxes. Any time I head out into the woods for at least a month, I scour the guidebook or maps ahead of time and plan my resupply locations. I look at the services the nearby towns offer and study the mileages and elevation gains between easily-accessible towns. Ideally, resupply locations are three to five days apart. In some sections of the Appalachian Trail, that might put town stops fewer than 50 miles from one another; other times, they might be upwards of 100 miles apart. I’m currently in the process of laying out the resupply locations for my 2015 hike of the Pacific Crest Trail, and it’s already apparent that the distance between resupplies will vary widely while I’m out there. 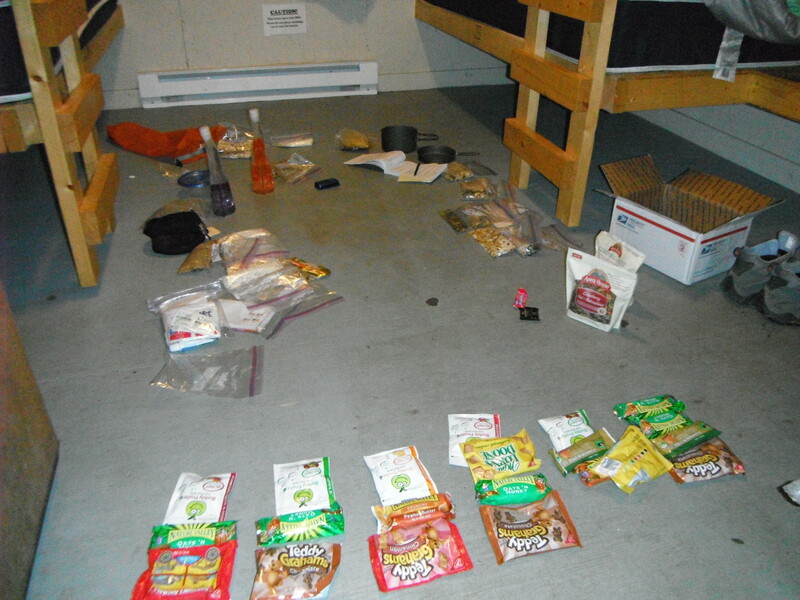 Organizing the contents of a resupply box I received at the Nantahala Outdoor Center in North Carolina. I was on a cookie kick, apparently. Once you have a list of planned resupply destinations, you’re ready to organize your resupply boxes. I think packing these boxes is best done slowly or in stages, but my mother is an expert at quick-packing them. Whatever your speed, you’ll need an area in your home that’s pest-free and able to serve as a resupply hub. Once your boxes are organized, it’s time for the fun part: packing them. Add breakfasts, lunches, dinners, and snacks to each box. I recommend aiming for variety; no one (except, perhaps, a certain hiker named Clif Bar Kid–or CBK) wants to eat one snack exclusively. If you choose to load the boxes over the course of several days, it’s a good idea to stick a checklist to each box to save yourself from having to recount snacks or dinners. After you’ve packed the food but before you seal the boxes, it’s important to throw in some other essentials. Sometimes, resupply boxes contain incredibly important gear, such as a cold weather sleeping bag. Most of the time, however, the only non-food items they contain might be things like toilet paper, bandages, toothpaste, or an empty journal. With the food and non-food items packed, you’re almost ready to go. This is a good time to call the destinations of the boxes to confirm that your packages will be able to be held for you and that the addresses you’ll be sending them to are correct. Once all that’s taken care of, it’s time to get out the tape, seal up the boxes, and send them on their way.